With Bluetooth and G'Mix, Casio's G-Shock GBA-400 is the toughest wearable tech to control of your mobile music. But can this simplified smartwatch compete with the touchscreen timepieces? Find out in the G-Shock GBA-400 review. Wearable tech is nothing new for the G-Shock brand, which is already onto its third generation of Bluetooth-enabled watches. But contrary to the usual evolution of gadgets, this new model has fewer features than the outgoing G-Shock GBA-6900, not more. Without the ability to alert you of incoming phone messages, we'd hesitate to call it a smart watch at all, but the new G'Mix music app potentially makes even better use of that Bluetooth connection. Now you can control your music without taking your precious smartphone from your pocket. So while Android Wear like the Sony SmartWatch 3, LG G Watch R and Samsung Gear Live struggle to balance useable functionality with desirable design, G-Shock is simply adding remote music control to the rugged format that has served it so well. In this glossy finish, it looks more disco than dirt trail, so can G-Shock still tough it out in the age of the smartwatch? The chunky resin casing is familiar G-Shock territory and, the GBA-400 is available in a range of eye-catching colours, with letters suffixing the model name indicating a blue, red, black/silver, or black/gold finish, so our blue one is the GBA-400-2A. Only one case size (51.9mm) is available, so if your wrists are a puny as ours, you might want to try one on for size before buying. Like all G-Shock watches, the GBA-400 is almost indestructible thanks to the thick layer of plastic resin and mineral glass that encases the electronics and tiny moving parts. It's water resistant to 200-meters and impervious to dust and sand. You also have a world clock, multiple alarm, LED light and a calendar on your wrist and if you still have trouble with big hands and little hands, there's a digital display of the time too. What sets this watch apart are the Mobile Link features made possible by the implementation of Bluetooth 4.1. Download the G-Shock+ and G'Mix apps from Google Play, or the Apple App Store and the watch can add remote music control to its feature set. And with SoundHound built into the G'Mix app, you can also identify tracks Shazam-style without touching your phone. Potentially useful for cheating in a pop quiz? In addition to using your watch to control your phone, the reverse is also possible. So now you can use the app to set the alarm, or change the settings of your watch without having to struggle with the fiddly and confusing buttons around the dial. The G-Shock team have clearly had a good think about what people really want from a Bluetooth-enabled watch and realised that the device in your pocket, the one with the high resolution touchscreen and supercomputer processing power, is better suited to messaging and social networking. So unlike the GBA-6900 predecessor, this one won't even alert you to incoming messages. 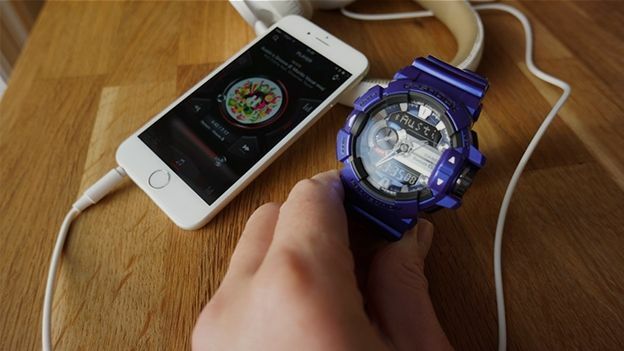 This streamlining makes the G-Shock GBA-400 more reliable when it comes to Bluetooth pairing, and although it still looses the connection after a period of non-use, it's much better at finding and linking with its assigned phone – in this case an Apple iPhone 6. Our Sony Xperia Z3 refused to recognise the watch, but that will probably change as Casio and Sony update their apps and firmware. Paired successfully, you now have very satisfying control over the music library on your phone, which is dead useful in situations where you'd rather leave your expensive phone in your pocket. That large dial on the right of the watch face which looks like the crown, or winding mechanism is your volume dial. By pressing the button below, it also lets you scroll through the sound EQ options and calls up SoundHound. The G'Mix app offers an alternative skin to iTunes on your phone, but with your watch and phone paired, you can also use that rotary dial to adjust the volume within any app, including BBC iPlayer Radio. We found that remote volume control soon became the most useful aspect of the watch. The G'Mix app is more than just an MP3 player though. With SoundHound integrated, it's easy to switch the watch's dial to 'search' mode so that the mic in your phone can identify the tune being played around you and see the result scroll across your watch. It's a bit of a gimmick, but great for appearing to be the biggest muso in the room. That is when it works of course. More obscure tracks, live music and mixes baffle SoundHound just as they do Shazzam. G-Shock lists the battery life as two years, assuming that you're only pairing with your phone for two hours a day. That's quite a long time thanks to the improved energy management of Bluetooth 4.1, but it's a pity Casio didn't find room to implement its solar cells onto this model to eek that out a bit more, as swapping the battery is damn fiddly. You will either love, or hate the macho G-Shock style already, but fans should be delighted that the inclusion of Bluetooth doesn't compromise the design, or hit the battery life too hard. Like every G-Shock, the toughness is unrivalled and their display is as crowded and difficult to read as ever. Why is it still so hard to read the display at night when you turn on the LED? What Casio has got right with this latest Bluetooth edition, however, is to make this connectivity useful. While so many of the current slew of smartwatches try to achieve too much, the GBA-400 simple and satisfying remote control over the tunes on your smartphone. Despite some issues, the Casio Pro Trek WSD-F30 appeals as a Wear OS watch for exploring the great outdoors with.